Hans Hagge’s 47 years of leadership at Employers Mutuals of Wausau helped the company become one of the largest mutual fire and casualty insurance organizations in America and perhaps the best known business insurance company in the nation…Wausau Insurance. Hans J. Hagge was born on October 20, 1886 in Andover, Iowa. He began his business career at a financial institution in Iowa and then established a successful court reporting agency in Chicago. Hans Hagge moved to Wausau in October 1911 at age 24 to take on the job of assistant secretary for the newly formed Employers Mutual Liability Insurance Company, which had just begun operations on September 1 of that year, the same day that the Wisconsin State Legislature passed the nation’s first Workmen’s Compensation Law. Hagge was the company’s fourth employee. The new insurance company struggled during its first two years. Total first year premium income was just $40,000! The concept of a mutual insurance company where policyholders owned the company was very new and business owners were skeptical, especially because the new workmen’s compensation law was voluntary. The company was in such poor financial condition by 1914, a state insurance investigator declared it insolvent. As the Wausau Group of investors was preparing to dissolve the company, Hagge stepped up and convinced them he could turn it around. 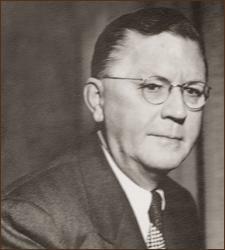 At age 27, Hagge was appointed general manager. Immediately, under Hagge’s leadership, the company started to grow and prosper. His careful work rewarded him with rapid promotions to executive positions. He became vice president in 1925 and was named president in 1931. In 1952, Hans Hagge was elected chairman of the board. At the time of his death in 1959, 45 years after Hagge was named general manager of a failing company, Employers Mutuals employed 2,750 people, reported annual premium of $106 million, and operated 105 branch offices in all states. Hans Hagge was highly respected not only by his employees, but also by his colleagues in the insurance industry. He served as president of the National Association of Mutual Casualty Companies, the American Mutual Alliance, and the National Association of Mutual Insurance Companies. In addition, Hans Hagge served on the board of directors of Marathon Electric Manufacturing, General Telephone Company, the Montana-Dakota Utilities Company, Insurance Finance Company of Wausau, First American Bank. He also served on the boards of the Wausau Chamber of Commerce and Milwaukee Downer College, and was a member of the Masonic Lodge in Chicago. He was one of a group of businessmen who started Gilbert Shoe Company. On October 15, 1913, Mr. Hagge married Helen Single of Wausau, daughter of Wausau lumber pioneer Benjamin T. and Susan Single. Junior Achievement of Wisconsin’s North Central District is proud to honor Hans Hagge as a 2010 Champion of Business.